Hi everyone. Im here with my art for kusuriuri. Hi guys! Sorry for such a late post, to make up for it I put in more effort and typed it up a bit longer! Summary: In which Kayo finds herself pulled into The Medicine Sellers world once again. Joined the community and finally got to post something that had been on my computer for awhile. *sigh* Tell me what you think! Mononoke was recently released on BluRay and to my great surprise, my roommate decided he needed it! When it came in, he was kind enough to let me take pictures of it! I apologize that some are a bit blurry and that they are photos, not scans. My scanner is unfortunately out of commission! 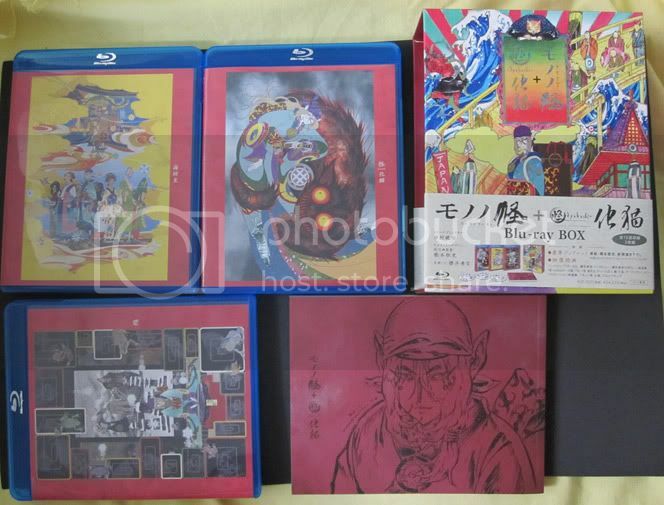 The series is on three BluRay discs and comes in a box and includes a booklet. As you can see by one of the covers, the Ayakashi Bakeneko arc is included with all the regular Mononoke arcs. So the deviantART Mononoke group is having a contest! I posted my entry for it here not too long ago [and I fail and never got back to it, but thank you so much to everyone's lovely and kind words]. As it turns out, the group's run into a bit of a problem because not enough people have entered. I wanted to drop in and encourage everyone to check it out! The theme is the Medicine Seller in the modern day, which I know I go into fangasming fits over. The entries must be visual art, I think--accepted formats include cosplay, traditional/CG art, and probably anything else you can come up with. Each entry has to have a brief narrative accompaniment about what the Medicine Seller's new adventures are. There are first, second, and third place prizes. Hellooo quiet little community. I come bearing art, as I usually do when I'm in this neck of the woods. The Mononoke club on deviantART is having a contest, themed for the Medicine Seller in the modern day. Each entry must have a short narrative accompaniment. So picture + drabble after the jump!